Is butter bad for you? 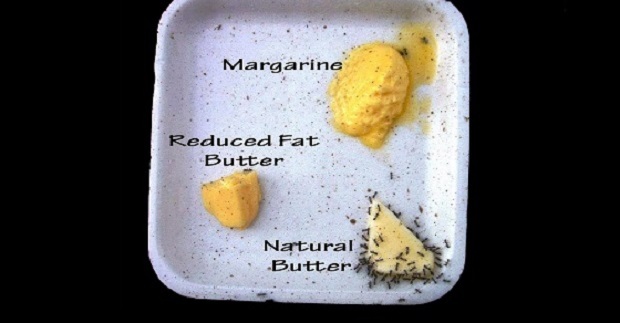 For decades, the food processing industry has used advertising campaigns to successfully lie about the urgent and proven need to replace “unhealthy” butter with “healthy” margarine. But now we know that this teaching was nothing more than made-up. In the battle of margarine vs butter, you may now be surprised which comes out on top. Even back in the 60s and 70s sufficient scientific evidence indicated that butter was far better than margarine for good health. Who knew? Nevertheless, the industrial fake food industry relentlessly convinced millions of us to eat margarine for health reasons. The commercial processed fake food industry merged with Madison Avenue, the AMA, and mainstream media to instill a whopper of a lie by reinforcing margarine as better for you. They claimed in unison that saturated fats made you fat and promoted cardiovascular disease. Partially hydrogenated fatty acids in margarine damage arteries and blood vessels. They lower good cholesterol, and raise blood levels of triglycerides and lipoproteins leading to cardiovascular damage. They also raise C-reactive protein, an inflammatory and cellular dysfunction marker. Worse yet, they inhibit the utilization of essential omega 3-fatty acids as wells a prostaglandins, which eliminate blood clots. Additionally, a diet high in partially hydrogenated fatty acids has been linked to insulin resistance and type 2 Diabetes. The NY Times covers hydrogenated oil health issues while still promoting saturated fat nonsense. In order to function properly, your lungs, heart, immune system liver, bones, hormones and cell membranes all require high quality saturated fats - in moderation of course. Fatty acids and cholesterol are needed for healthy cell membranes, hormone and vitamin D production, and the transport and utilization of important vitamins and minerals. Now even mainstream media is spreading the truthful real news on butter. The New England Journal of Medicine recently solidified the link between trans fats and heart disease. Even low levels of trans fats consumption (1%-2%) substantially increase heart disease. At the top of the pyramid is organic butter made with raw milk from grass fed cows. The middle level is organic butter with pasteurized milk from grass fed cows and without rBGH, rBST, or antibiotics. The pyramid’s base is butter made from pasteurized milk from confined, grain fed, factory farmed, antibiotic and likely rBGH or rBST injected cows. 1. Conjugated Linoleic Acid (CLA) - Raw organic, pastured butter has loads of anti- tumor CLA. It inhibits the growth of cancer cells in the skin, colon, breasts and lungs. It’s anti-fungal and it stimulates muscle growth while preventing weight gain. 2. 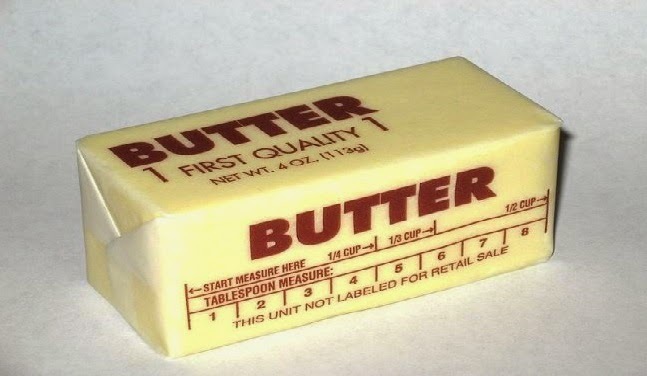 Butyric Acid - Butter contains 4% butyric acid – a short chain fatty acid that research indicates can inhibit tumors. It also signals the immune system into action when an infection is brewing. 3. Vitamin K2 - Raw, organic, pastured butter and cream contains vitamin K2 – a necessary co-factor in vitamin D synthesis. K2 also ushers calcium out of your blood stream and into bone cells which increases bone density instead of calcifying arterial and heart tissue. Check out Mike Barrett’s article on vitamin K deficiency symptoms. 4. Fat–Soluble Vitamins – Butter is a good source of the fat soluble vitamins A, D, and E. It’s also an excellent vehicle for their assimilation. 5. The Wulzen Factor - Raw, unpasteurized butter, cream and milk contain the “Wulzen factor” an anti-stiffness agent. It protects against calcification of the joints (osteoarthritis) as well as cataracts, and the calcification of the pineal gland. Pasteurization destroys the Wulzen Factor. Raw, organic butter is a superfood that won’t make you fat if consumed in moderation. It fact, it consists of short chain fatty acids (SCFA) and medium chain fatty acids(MCFA), which are not significantly stored as fat but easily used as energy. This may finally be the end of the butter vs. margarine battle.